It’s time travelling time at GSS, and today we’re travelling back to the Jurassic, Late Jurassic and the Pleistocene periods, all at the same time! Yes you heard me right, as here in the Plänterwald leisure area, Berlin, we can see what appears to be a Diplodocus (from around 200 million years ago), a Stegosaurus (146 million years ago), and a Mammoth (from a relatively tiny 1.6 million years ago) all enjoying a nice day out. More about the unfathomable enormities that are Geologic time periods at Wikipedia. Haha, if you travel south down the river a little bit, you can see a guy kayaking. This dinosaur was constructed in 1980 using concrete and had to be teared down in August 2005 due to danger of collapse. These are on a small island in Crystal Palace Park, South London. 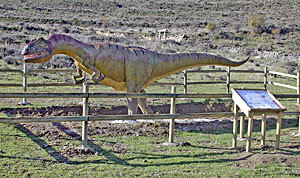 Don’t forget the Cabazon Dinosaurs, G J Oliver’s Steel Dinosaurs and the elusive Bennie The Dinosaur. More dinos in Plant City, Florida, at Dinosaur World. Not terribly visible in this aerial photo, but the orange blob in the middle is the big dinosaur model that can be seen while driving Interstate 4. Oh no! They’re taking over! Curses, now I’ll never get to use another phone again! I’ll need some kind of little talking Pterasaur like in the Flintstones! 1- BRACHIOSAURUS (in Villar del Rio) – Good shade. Alex: that’s what they WANT you to think. We know better now, thanks to “the Google”. Plänterwald is a great place for urban exploration. However watch out for the locals living their cause they really dont like people on their land.